CSX can lead the transportation sector to the fast track, if the railroad beats earnings estimates and gives solid guidance after the close Wednesday. CSX Corp. (CSX - Get Report) can lead the transportation sector to the fast track if the railroad beats earnings estimates and gives solid guidance after the close Wednesday. CSX is a component of the iShares Transportation Average ETF (IYT - Get Report) and has similar chart characteristics. This makes earnings for CSX important for the sector, which has lagged the overall market. CSX provides freight railroad services of intermodal containers and trailers for bulk commodity companies such as the energy producers. The stock has an elevated P/E ratio of 18.76 and offers a dividend yield of just 1.35%. This makes the stock more of a play on technical momentum. The stock closed Tuesday at $65.11, up 4.8% so far in 2019, and in correction territory 14.5% below its Aug. 28, 2018 high of $76.24. CSX is 11.4% above its Christmas low of $58.47 set on Dec. 26. IYT closed Tuesday at $171.90, up 4.2% year to date and in correction territory 17.9% below its Sept. 14, 2018 high of $209.43. IYT is 10.7% above its Christmas low of $156.24 on Dec. 24. CSX will release its fourth-quarter earnings on Jan. 16. The railroad beat analysts' estimates in four consecutive quarters. Even so, the stock has been trending lower since Aug. 28. The company has been benefiting from lower costs and its Precision Scheduled Railroading system should continue to enhance operations efficiency. Wednesday CSX closed up 0.41% to $65.38 and IYT ended up 0.49% at $172.74. The daily chart for CSX shows that the stock needs a positive reaction to earnings to avoid a "death cross" as the 50-day and 200-day simple moving averages are converged at $67.20 and $67.25, respectively. 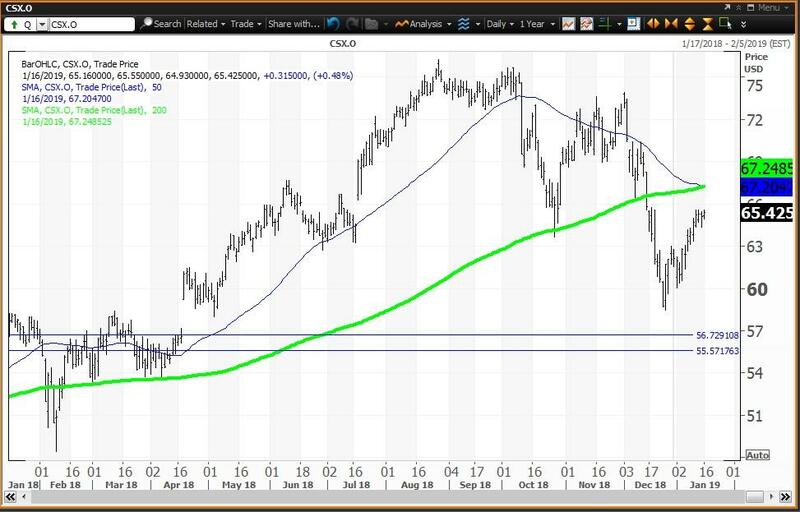 A negative reaction to earnings would end the rally from the Dec. 26 low, which would indicate risk to the two horizontal lines, which are my semiannual and annual value levels of $56.71 and $55.56, respectively. A positive reaction to earnings needs to result in a trend above the 200-day SMA. 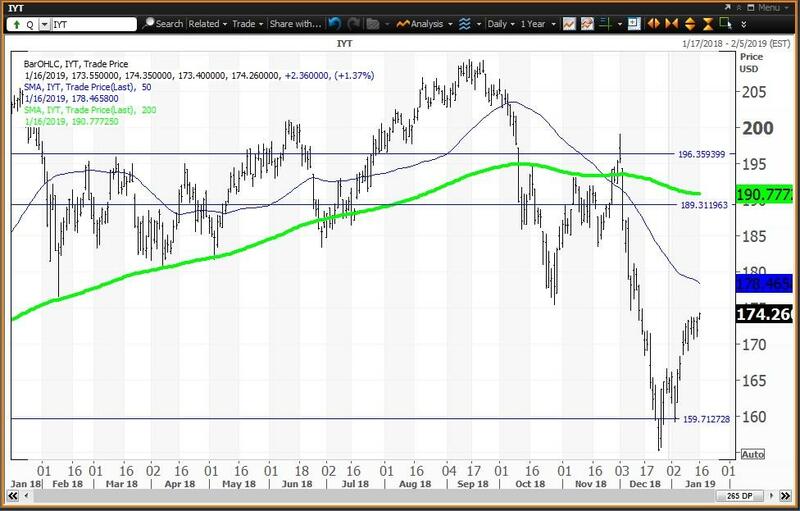 The daily chart for IYT shows that the ETF has been below a "death cross" since Nov. 26, which led IYT to its Dec. 24 low of $155. 24. When 2019 began, I showed a semiannual value level at $159.64, which held as a buying opportunity on Jan. 3. The 50-day and 200-day simple moving averages are $178.47 and $190.78, respectively. The higher two horizontal lines are my monthly and annual risky levels at $189.29 and $196.33, respectively, which makes a new high in the first half of 2019 highly unlikely. The weekly chart for CSX will shift to positive if the stock ends this week above its five-week modified moving average at $65.62. The stock is well above its 200-week simple moving average or "reversion to the mean" at $44.52. The 12x3x3 weekly slow stochastic reading is projected to end this week rising to 31.48, up from 28.04 on Jan. 11. Given these charts and analysis, my trading strategy is to buy a core long position in CSX anticipating that the weekly close will be above $65.62. If strength fails below the 200-day SMA at $67.25, sell this holding. Then be patient and buy on weakness to my semiannual and annual value levels at $56.71 and $55.56, respectively. 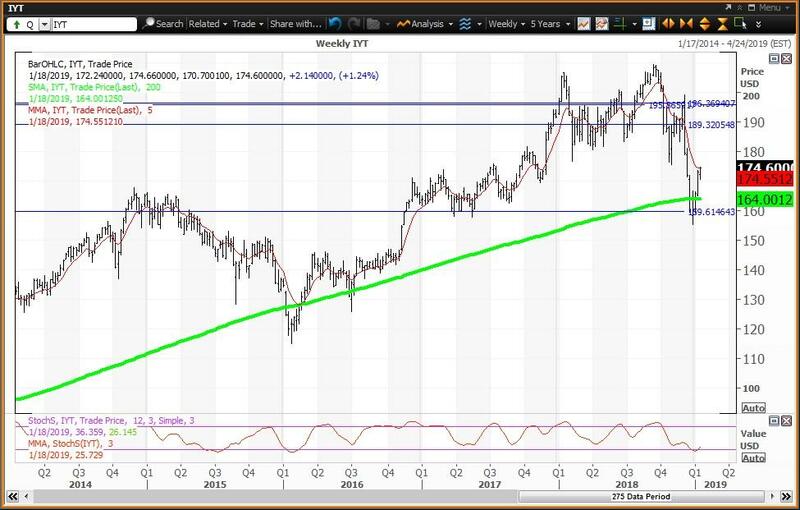 The weekly chart for IYT will shift to positive if the ETF ends this week above its five-week modified moving average at $174.44. The stock is above its 200-week simple moving average or "reversion to the mean" at $164.00. The close above this average on Jan. 4 was a positive that targeted the five-week MMA. The 12x3x3 weekly slow stochastic reading is projected to end this week rising to 25.72 up from 20.41 on Jan. 11. Given these charts and analysis, if you have a core long position in IYT reduce holdings given a weekly close below the five-week MMA at $174.44. 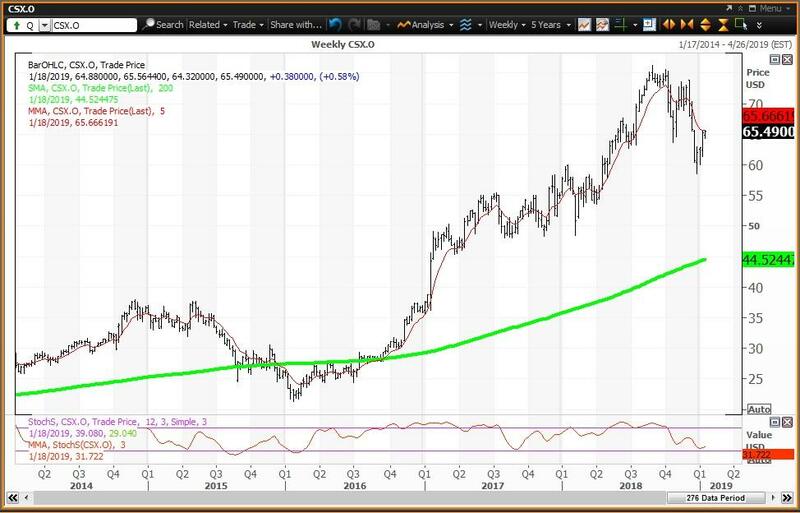 Buy weakness into the zone of the 200-week SMA at $164.00 and to my semiannual value level at $59.63. Sell strength to my monthly, quarterly and annual risky levels at $189.29, $195.63 and $196.33, respectively.